I’d mentioned that I was planning to read this book, and once I had it, only a few days passed before I finished. 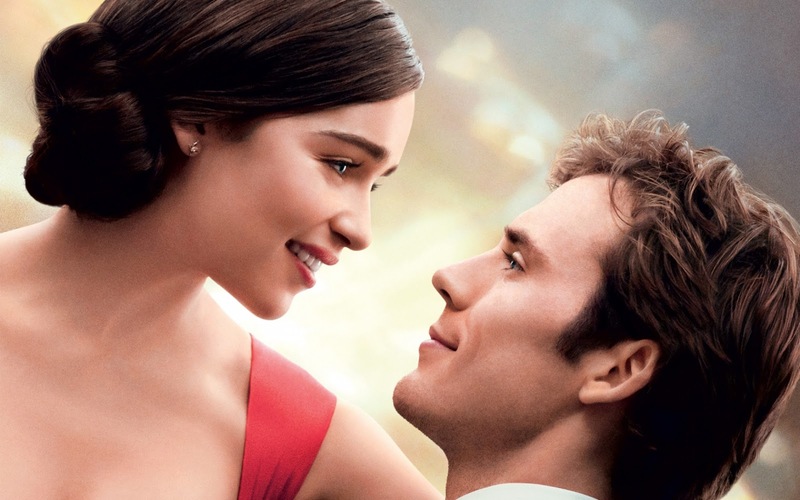 Will Traynor and Louisa Clark, an executive-turned-quadriplegic and his fun-loving caretaker, had me wrapped from the beginning. The story is engaging, the characters charming, the writing excellent, and overall…well, it took me a while to decide. There are many, many layers to this book. I closed it and felt so conflicted about it. 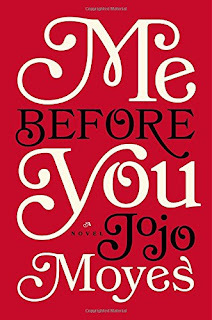 I greatly respected and enjoyed Jojo Moyes’s storytelling ability, and the plot is entertaining, thought-provoking, and fascinating. In particular, the characters are fantastic, endearing, and made me both cry and laugh out loud. I was especially impressed with Moyes’s ability to inject tasteful, well-crafted humor into such a serious subject as quadriplegia. But on the flip side, Will’s quadriplegia also prompts a sensitive, difficult issue that draws strong and varied opinions. Gentle spoiler: I do not agree with its resolution in the story, which many people would call harsh, unsympathetic, or ignorant. And so I thought harder about the ending, why I disagreed with it, and whether it could have ended differently and satisfyingly. Ultimately, I appreciated the book for that. Even though I was disappointed in the conclusion, I had enjoyed reading it and it had made me think. It made me squirm a bit and forced me to wrestle with a hard question or two. How would I have felt in Will’s position? I don’t know. There’s literally no way I can understand someone in that situation. But at the same time, what about the people around him who cared for him? And what if it had ended differently? Would that have been believable? I honestly think that maybe it could have. And what would I have done if I were Louisa? Did she do the right thing at the end? I’m still working on that one, to be honest. Lots of questions, lots of thinking. And that’s ultimately one thing I appreciated most about Me Before You. Personally, I know an author is exceptionally talented when he or she makes me think for days and weeks. Even though I wish the book had ended differently, it’s an excellent one with a strong plot, brilliant characters, and complex themes. Hard issues are addressed honestly and the characters’ emotions are raw and palpable. And I think all of that certainly makes a story worth reading. Definitely try to read this one before the movie hits the screens! As usual, I can’t wait to compare. 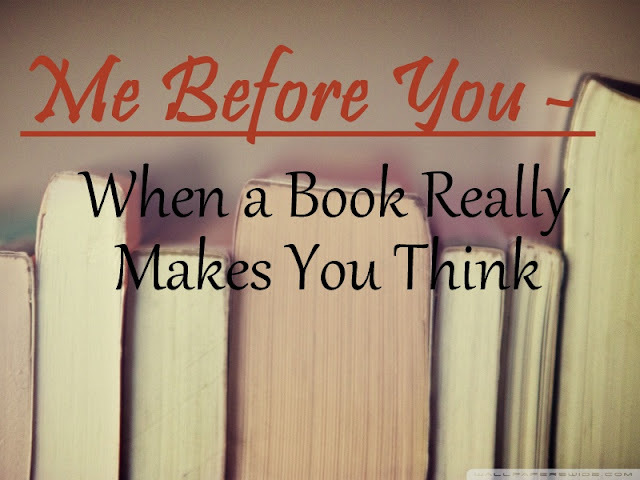 Have you read Me Before You? What did you think? What did you like or dislike? How did you feel about the controversial plot resolution? Please let me know in the comments! I’d love to hear and discuss. Oohhhh. You've definitely sparked my interest. Like you, I have seen the trailer and thought I would like to go and see it, and I'm one of those people who always likes to read the book first (and I haven't read this one). I totally get what you mean about disagreeing with a book, but appreciating that it makes you really think about what you believe and why. I think that's when fiction is at its greatest, because it can create the emotional conflict that so often muddies the waters, but gives us a chance to step back and think things through without having the pressure of actually making the decision ourselves. These are my thoughts to a T! 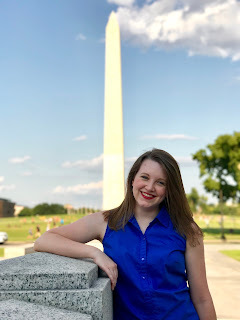 I was so involved in the story and loved the characters and I had planned to write a review for it, but I had no words unless it was going to be all the words, so I just didn't write one. ha! I don't agree with the resolution either, but it was a great discussion for book club and to make you think hard about not so easy topics.